About the time school is back in for the kids, I always bring out my trusty dessert recipe that makes the house smell of fall and gets everyone in the mood for the new season. I must admit, there is something to love about every season, but fall is extra special because as a child, I always looked forward to a new school year. Making new friends, getting all the new cool school supplies and books for the coming year, and coming home every afternoon to share it all with my mother with one of her yummy afterschool snacks. North Carolina produces many varieties of apples and they are in abundance here in the fall. 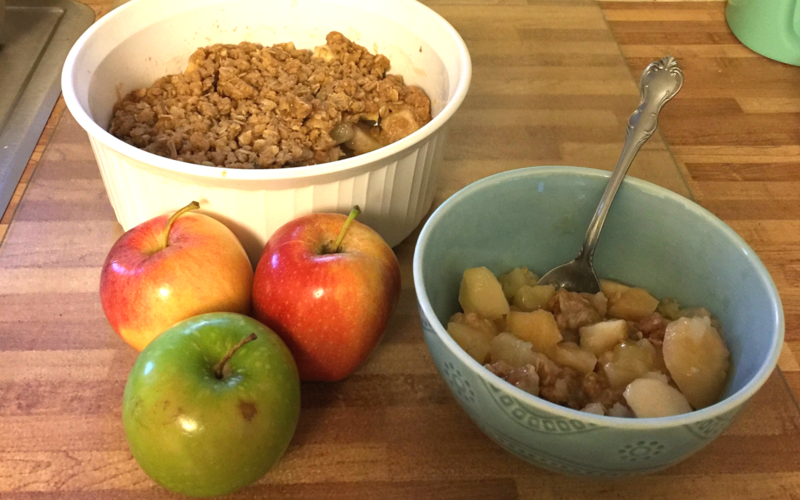 One of my mom’s favorite recipes that I always make every fall is Apple Crisp. When I make it, I still think back of sharing my school day with my mother and then years later, eating it with my own daughters as they told me about their day. 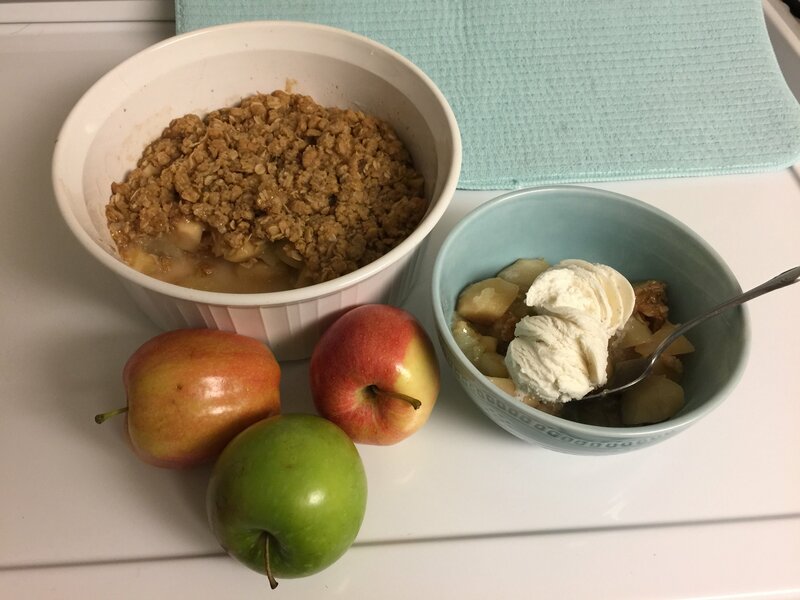 It is a great little dessert you can whip up with ingredients that are all staples in most any kitchen, except for the apples. If you are lucky enough to get to a roadside stand for fresh ones, Granny Smith, Gala or Honeycrisp apples are my favorite for baking. They are slightly crisper and tart and hold up well in any recipe. For this recipe, I used Granny Smith and Gala. 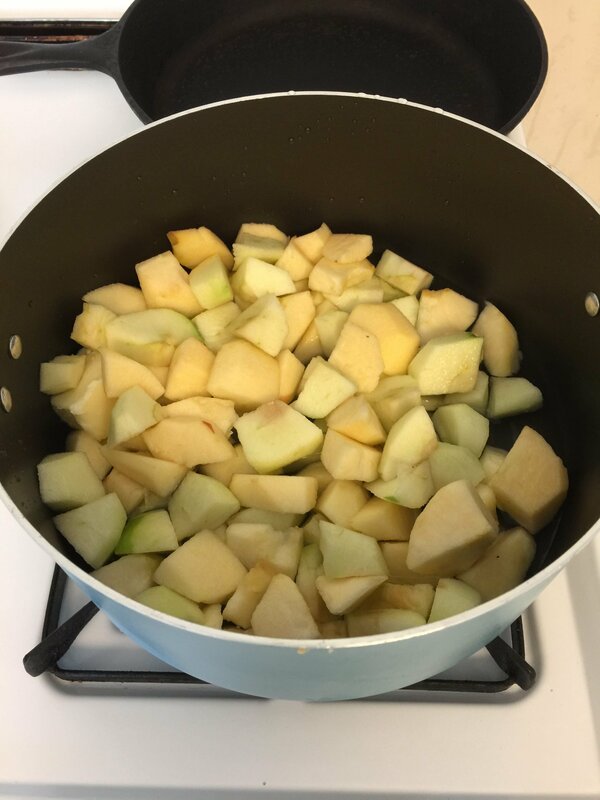 After I have peeled the apples, I place them in a pot with a small amount of water. I also squeezed the juice of one lemon to the mixture to stop the apples from browning. Once they begin to boil, turn down the heat and let them slowly boil for about 5 minutes. I don’t like my apples to be too soggy. You may prefer to leave the peelings on. That is perfectly ok. It is strictly a matter of preference. Once they have finished boiling, remove from the heat and drain in a colander. 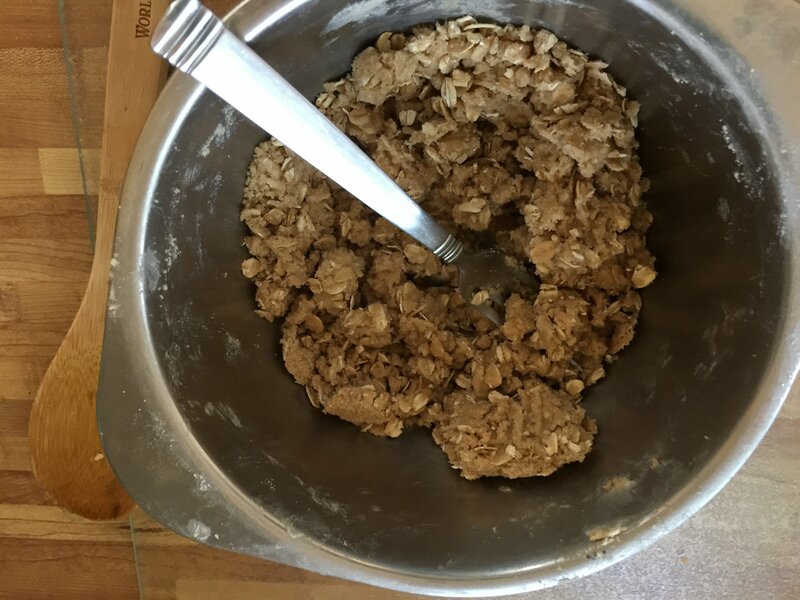 Make sure all the liquid is out before you begin to mix the filling. 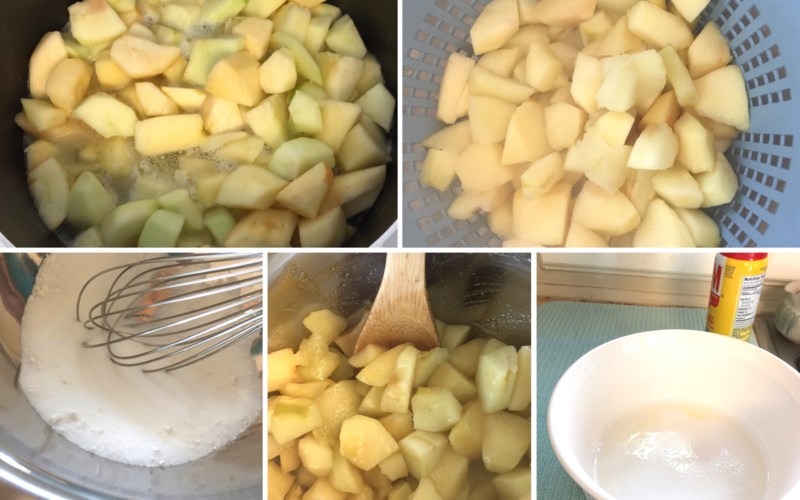 To the apples add your ½ cup granulated sugar and 1 tsp. flour. This will thicken the filling a little. Mix all together and place in a shallow casserole dish that has been sprayed with any non-stick product. Preheat oven to 350°. For the topping, I first mix all the dry ingredients well, then cut in the butter with a fork or pastry blender. 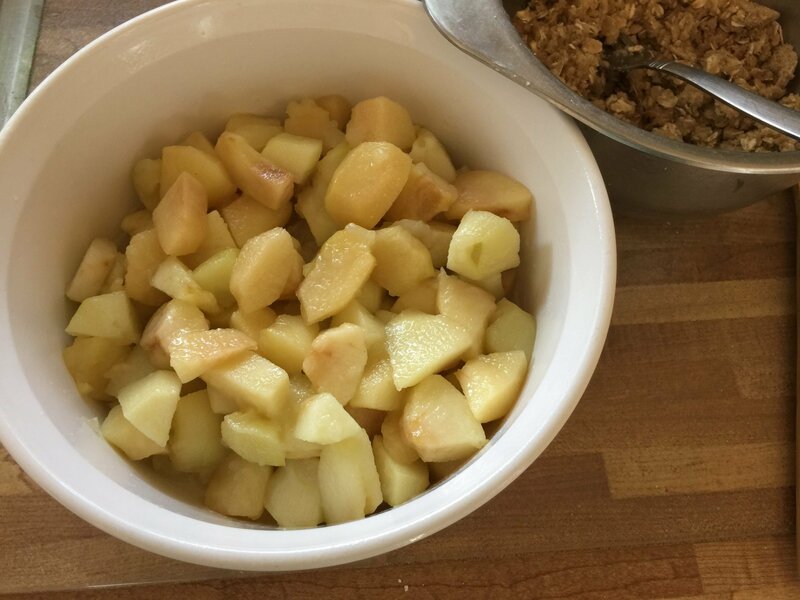 Once everything is mixed well, crumble on top of apple filling. 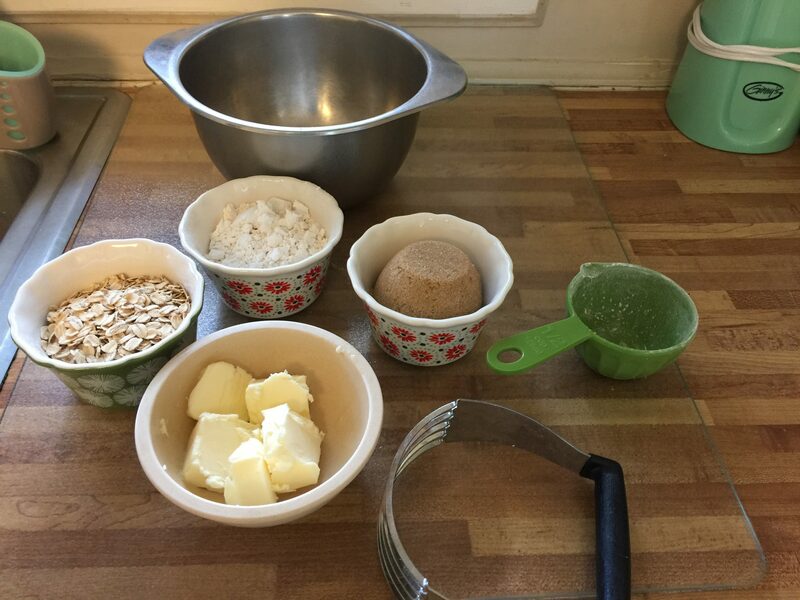 I love these Pioneer Woman bowls because they are the perfect size for getting the ingredients ready. Bake at 350° until brown and bubbly, about 30 minutes. Now heaven forbid you use a can pie filling for this recipe. It just is not the same! 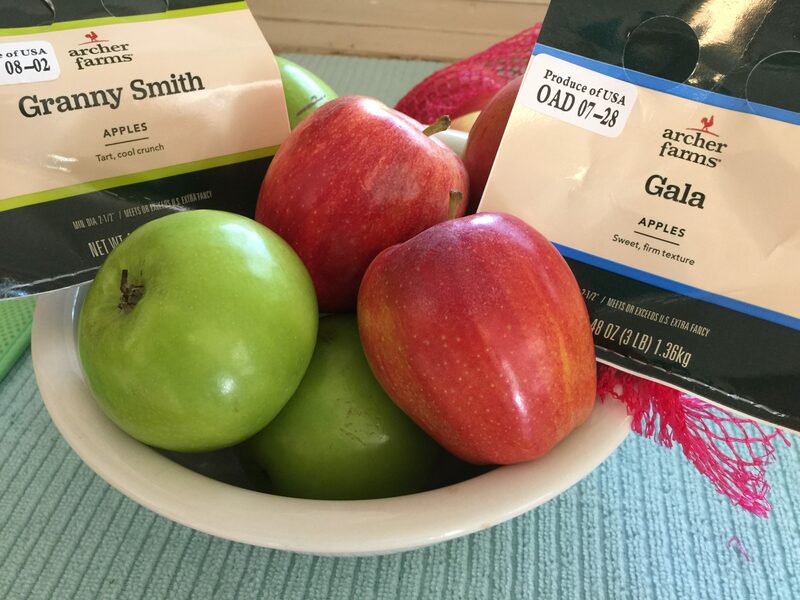 Getting those fresh apples and taking the little bit of extra time in preparation will be worth it! And don’t forget the vanilla ice cream!